THEY improv helps companies to think outside the box and to get new perspectives on issues that directly effect the bottom line. We can consult with your group and listen to your needs. We come at it with a mind's eye of finding the best approach for your group to better achieve your goals wherever they may be in North Florida. With years of experience providing Jacksonville business consulting services, the staff of THEY improv bring their skills to solve your needs. Whether you are looking for help in achieving corporate culture change, merger or acquisition assimilation, simple team building workshops, leadership training, employee recognition, bonding, meetings and incentives or skills training, the professionals at THEY improv can assist you in unique ways. JAX has a quality port, several military bases and an economic center that continues to grow. There is a special need for quality Jacksonville business consulting services to serve multi-national companies, military clients and defense contractors alike. Likewise, with the proximity of the port, serving the various tourist agencies, the cruise lines and other organizations, Jacksonville business consulting services requires high skill and attention to detail as well as cultural sensitivity. 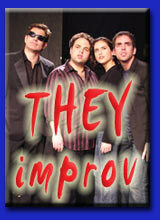 THEY improv can provide these functions, as well as corporate events and private parties, in Duval County and everywhere else in the JAX area including around the Airport, Northside, Downtown, Riverfront, Avondale, San Marco, along the Riverwalk, the Landing, Westside, Ortega, Orange Park, Southside, Arlington, across the Intracoastal Waterway in Mayport, Atlantic Beach, Neptune Beach and elsewhere in the area including St. Augustine, Amelia Island, Fernandina Beach, Palm Coast, Flagler County and Ponte Vedra. Likewise, we have professionals throughout the rest of Florida.